After falling one game short of a World Series title last season, the Los Angeles Dodgers have set their sites on cutting payroll this offseason. They took a big step toward doing that on Saturday in a five-player trade with the Atlanta Braves. In the trade, Los Angeles acquired longtime Dodger outfielder Matt Kemp. In return, the Dodgers sent the Braves $4.5 million cash, as well as four players: Adrian Gonzalez, Scott Kazmir, Brandon McCarthy, and Charlie Culberson. Immediately after the trade, the Braves designated Gonzalez for assignment. The 35-year old is coming off an injury-plagued season and is owed $21.5 million in 2018, the final year of his contract. Outside of the $4.5 million they got from the Dodgers, the Braves are on the hook for his contract. 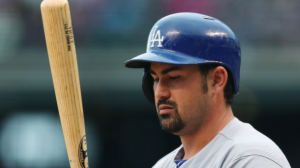 Gonzalez will only cost any team willing to sign him the major league minimum. However, one has to wonder if he has anything left in the tank. Kazmir is another huge question mark who will cost the Braves $16 million in 2018, which is the final year of his contract. The soon-to-be 34-year old lefty missed the entire 2017 season because of issues with both his arm and hip. If he returns to full health, he could be a useful part of an otherwise young and largely unproven Atlanta rotation. However, there’s no guarantee he’ll be healthy enough to pitch for the Braves in 2018. McCarthy has a slightly better chance of contributing to the Braves next season. Over the last three seasons, he’s made just 29 starts and four relief outings because of Tommy John surgery and a variety of health issues that followed. On the bright side, he was healthy at the end of the 2017 regular season, so the Braves may be able to find a use for him next season. McCarthy will make $10 million in 2018 before becoming a free agent. Culberson may end up being the most useful player Atlanta acquired in the trade. He’s been a utility player with three different big league teams in his career and has yet to produce much offensively. However, he’s a sound defensive player and could provide a suitable backup for the young middle infield of Dansby Swanson and Ozzie Albies. Trading away Kemp also opens a spot in Atlanta’s outfield for top prospect Ronald Acuna. The 19-year old Acuna is one of the top prospects in all of baseball. He finished the 2017 season at triple-A and may even have a chance to be with the Braves on opening day. As for the Dodgers, they cut over $40 million in payroll by trading Gonzalez, Kazmir, and McCarthy. At the same time, they have added the two years and $43 million left on Kemp’s contract. Early indications are that Los Angeles will try to flip Kemp to another team, so he may not suit up for the Dodgers in 2018. Kemp was a productive player in 2017, hitting .278 with an OPS of .781. However, he’s not worth nearly as much as his salary would indicate, which could make him difficult for the Dodgers to trade without taking on a significant chunk of his salary. Obviously, this is an unusual trade. Ultimately, the Dodgers have more than enough roster depth to survive without all of the players they traded away. They are also hopeful that they can trade Kemp to further reduce their payroll. Meanwhile, the Braves add three players who are more or less a crapshoot to help them in 2018. We won’t know until late in the 2018 season if either team benefits much from this trade.